Emperor Akihito, 84, was a 47-year-old crown prince on Aug. 7, 1981, when he faced reporters during a news conference in Tokyo. He was asked to comment on the upcoming Aug. 15 anniversary of Japan’s surrender, which ended World War II in 1945. The days he cited were all in 1945: June 23, when the Battle of Okinawa ended after more than 200,000 soldiers and civilians had died; Aug. 6, when the atomic bomb was dropped in Hiroshima; Aug. 9, when a second atomic bomb devastated Nagasaki; and Aug. 15, when his father, then-Emperor Hirohito, announced to the Japanese people via radio that Japan had lost the war and was surrendering. “I observe a moment of silence on those days. And then I treasure the preciousness of peace,” then-Crown Prince Akihito told reporters. The comments he made that day are still quoted by historians and the media when they discuss the importance of the war-related ceremonies for Emperor Akihito. Commemorating the war victims and meeting their relatives “have been a pillar of his work as the Emperor, the symbol of the unity of the nation,” said Yuji Otabe, professor emeritus of Japanese history at Shizuoka University of Welfare. Emperor Akihito was born on Dec. 23, 1933, as the eldest son of Emperor Hirohito, posthumously known as Emperor Showa. The wars Japan waged in the 1930s and 40s were fought in the name of Emperor Hirohito — conflicts that left 3.1 million Japanese and countless others across Asia and the Pacific dead. Under the postwar Constitution, the Emperor is not allowed to engage in political activities, making it difficult for him to extend any explicit apologies regarding the war. But after the war, both Emperor Hirohito and Emperor Akihito appear to have felt responsible for its awful consequences, including the massive loss of life, Otabe said. When the war ended, then-Crown Prince Akihito was 11. When he returned to Tokyo from his shelter in Nikko, Tochigi Prefecture, he saw a capital devastated by massive U.S. air raids. One such attack on March 10, 1945, alone killed an estimated 100,000 people and gutted 270,000 homes in the capital. Much of Tokyo was left in ruins — just ash and rubble — as were most other major Japanese cities. “The Emperor (Akihito) did experience the war. That’s the key reason” he has passionately attended war-related ceremonies, Otabe said. 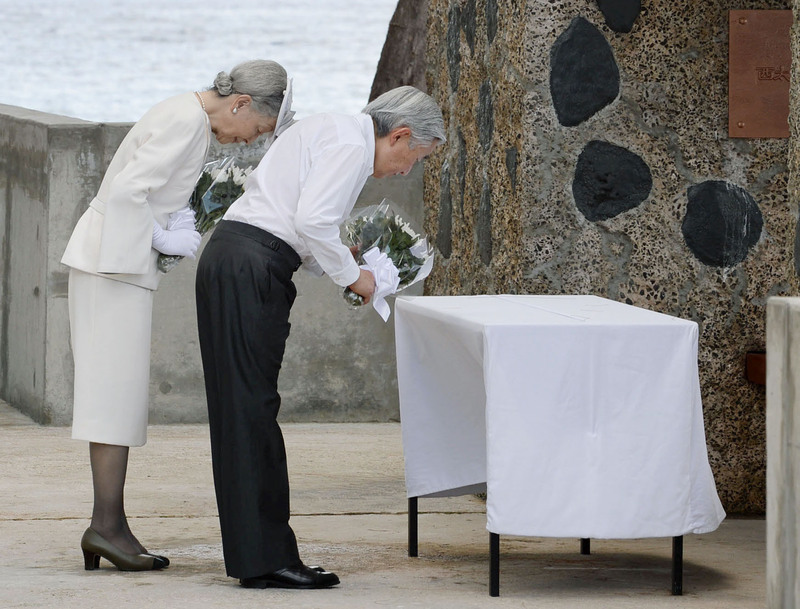 Over the past 30 years, he and his wife, Empress Michiko, have visited numerous war-related sites and met with survivors there, including those in Hiroshima, Nagasaki, Okinawa, Iwo Jima, Palau, Saipan and the Philippines. In particular, the Aug. 15 national ceremony to commemorate the victims of the war that is held annually at the Nippon Budokan in Tokyo’s Chiyoda Ward, with the Emperor, Empress and prime minister in attendance, is a major event that is televised nationwide. During the ceremony, attendants observe a moment of silence at noon, the exact time when the recorded voice of Emperor Hirohito was aired via radio on Aug. 15, 1945, to announce Japan had surrendered by accepting the Potsdam Declaration issued by the United States, Britain and China on July 26 the same year. The Soviet Union joined the declaration on Aug. 8. 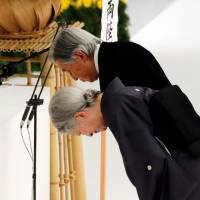 This year’s ceremony, particularly, should have special meaning for Emperor Akihito as it will be the last one he will attend as emperor. He ascended to the Imperial throne in 1989 and is set to abdicate at the end of next April. 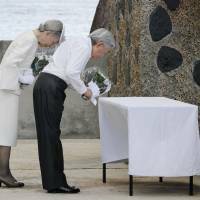 For many years Emperor Akihito delivered a short address of almost the same phrases to commemorate the war victims during the Aug. 15 ceremony. But in his address in 2015, the 70th anniversary of the end of World War II, the Emperor surprised the nation by expressing “deep remorse” over the war. “Reflecting on our past and bearing in mind the feelings of deep remorse over the last war, I earnestly hope that the ravages of war will never be repeated,” the Emperor said in the address. “Together with all of our people, I now pay my heartfelt tribute to all those who lost their lives in the war, both on the battlefields and elsewhere, and pray for world peace and for the continuing development of our country,” he said. Those exact words were repeated in 2016, 2017 and this year, too. 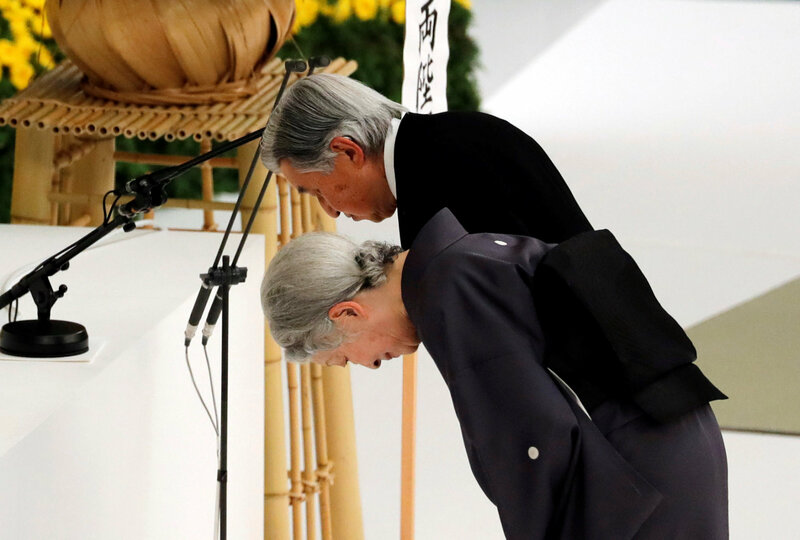 Emperor Akihito’s use of “remorse” has roused much speculation. Some people say it is designed to implicitly emphasize Japan taking responsibility for its past aggression in Asia. Others have maintained the Emperor used the term because Prime Minister Shinzo Abe stopped using it in his own annual Aug. 15 address at the ceremony since 2013. Many prime ministers of the past in fact have uttered the words “profound remorse” when delivering their addresses in the commemoration ceremony. Many have also include in their annual Aug. 15 speeches the same sentence, “Japan caused tremendous damage and suffering to the people of many countries, particularly to those of Asian nations.” Those prime ministers include Taro Aso, Yasuo Fukuda, Junichiro Koizumi, Yoshiro Mori and Keizo Obuchi, all of the ruling Liberal Democratic Party. Abe himself used the phrase in his address in 2007 during his first prime ministership. But after he began his second stint as prime minister in December 2012, he stopped touching on the “tremendous damage and suffering to the people of many countries” Japan caused during the war. Instead he has emphasized that “the devastation of war” should never be repeated. Liberal, left-leaning intellectuals have criticized Abe for no longer mentioning the damage and suffering Japan caused. Meanwhile, conservative, right-leaning politicians and intellectuals praise Abe, saying it’s time for Japan and its neighbors to put the past behind them. They accuse China and South Korea of politicizing issues related to the war and Japan’s colonial rule of the Korean Peninsula for political gain. And Japan itself still seems to be deeply split over war-related issues 73 years after the end of the conflict. In general, the Emperor has remained tight-lipped and avoided expressing his own views on politically sensitive topics. He appears to be well aware of the legal restrictions placed on his position by the Constitution: the emperor, as the symbol of the nation, is allowed to engage only in politically neutral events. Yet at least one thing remains clear — there is no doubt the war he witnessed during his childhood left an indelible, and possibly the strongest, impact on his life as the Emperor. On Dec. 18, 2013, Emperor Akihito was again facing reporters during a news conference that was arranged five days ahead of his 80th birthday. Reporters asked what was the most memorable event for him over the past 80 years. His answer was unwavering. “I would say that what stands out most in my mind is the Second World War,” Emperor Akihito said. “About 3.1 million Japanese people are said to have lost their lives in that war. It still pains me deeply to think that so many people, who must have had various dreams and hopes for the future, lost their lives at a young age,” he said.